Are you toxic? It’s hard not to be in a world filled with pollution along with food toxins such as dyes, fillers, additives and preservatives. Toxins can adversely affect us from brain to toe, damaging our cells, creating numerous health problems and accelerating aging. But one good way to rid the body of toxins is with nutrient-charged soups, says Cherie Calbom (www.juiceladycherie.com), a best-selling author and nutritionist whose latest book, Souping is the New Juicing, includes a toxicity quiz. “Soup can be a part of any detox program,” Calbom says. “What if you never changed the oil or filters in your car? Our bodies are a bit like our cars. They have filter systems that need to be cleaned out and fluids that need to be flushed out. That’s where souping comes in, offering an abundance of antioxidants, phytonutrients, vitamins and minerals. On medium heat sauté garlic with olive oil and salt. Add chopped broccoli and stir for five minutes. Stir in spinach until the leaves are wilted, then add the rest of the ingredients. Stir and simmer for 15 minutes on low to medium heat. Sauté the onion and celery with half the salt until translucent, about five minutes. Add zucchini and sauté for three more minutes. Add broth and the other half-teaspoon of salt. Stir in almond butter, bring to boil. Add the watercress and let simmer for five minutes. Recipes and info are courtesy of Cherie Calbom, MSN (aka The Juice Lady). You can connect with her on Facebook and Twitter and sign up for her free newsletter at www.juiceladycherie.com. 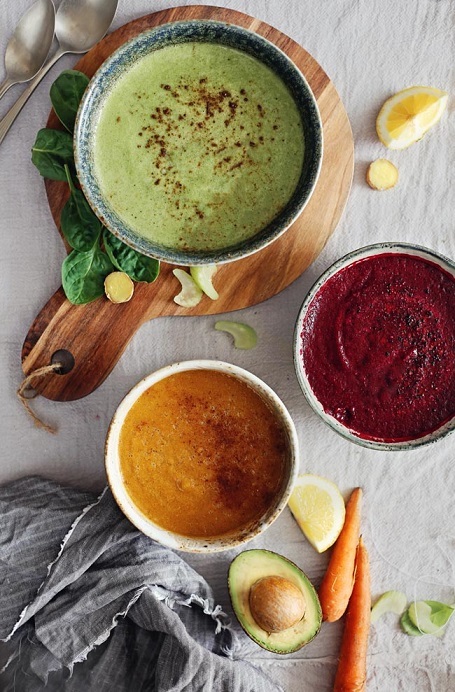 These soups sound so delicious that it is hard to believe that they are also good for you. I would love to eat any of them.